L. Schmidt, B. Curley 2005 18 72 7059 40 minutes from downtown. Best Ocean Golf Club is a golf course that every golfer playing in Thailand needs to try at least once located west of Bangkok and near to the sea; the breezes at Best Ocean lend themselves to very pleasant playing conditions, the course’s links style layout makes Best Ocean unique among Bangkok’s top courses. 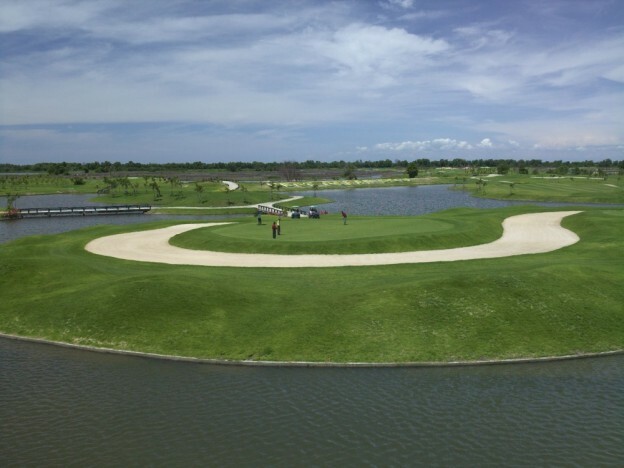 The course has narrow fairways and elevated, well guarded greens, both characteristic of award winning Schmidt-Curley designs, there is water on every hole with most holes even having water left and right. Well struck drives are required to land on the many island fairways, accurate approach shots are then needed to hit the well guarded greens, otherwise water or sand is a sure result. This is a course that demands planning and strategy from the tee to the green and golfers should be warned to bring lots of extra balls.